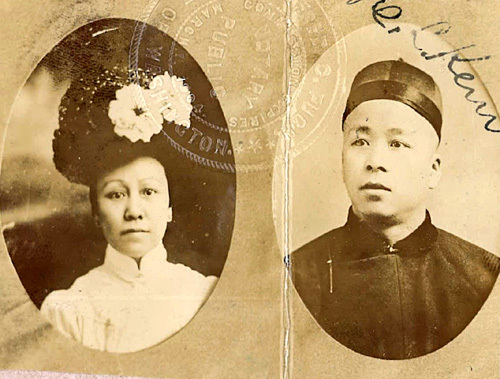 “Photo of Fong Gum and Sam Chong,” 1902, Chinese Exclusion Act case files, RG 85, National Archives-Seattle, Mrs. Wong Cue (Fong Gum) case file, Seattle, Box 43, 31-88. Fong Gum was born in San Francisco, California about 1876 and moved to Spokane around 1898. According to a 1902 statement in the file Fong Gum and Sam Chong/Chung were married in Spokane County in September 1901. Sam Chung was a member of S. Chung and W. Ting firm at 127 Washington Street, Spokane, Washington. There is nothing in the file that tells what happened to Sam Chong/Chung but Wong Cue, a merchant tailor, and Fong Gum were married in Coeur D’Alene, Idaho about 1907 or ’08. Their witnesses were Mrs. McDonald and her husband who was a street car conductor. In 1923 Mrs. Wong Cue was the proprietress of Ladies’ Popular Garment Store, 317 South Main St., Butte, Montana. Her status with the U.S. Department of Labor Immigration Service was as a merchant independent of her husband. [This is very unusual and the only file I have seen where a woman is listed as a merchant.] Her business was in a building own by Mr. B. Marcello. He charged $30 rent per month. She paid all of her own expenses and netted about $35 to $40 each month. The store was about 30 by 80 feet and she lived in the back. For the last two years she and her husband had lived separately. Mrs. Wong Cue was planning a trip to China in 1923 and taking her adopted daughter, Po Lin and nephew, Lee Hoy, with her. Mrs. Wong Cue told the immigration interviewer that she bought her merchandise stock from Hennessey’s, Symons, and sometimes O’Connell’s. She sold ladies garments. Sometimes she made her own garments and sometimes she bought them. Her white witnesses were Mrs. Gordon Schermerhorn, Mrs. Jane Lammie and Mr. B. Marcello. Mrs. Lammie testified that she came from Scotland almost three years ago to join her husband, a baker at Rex Bakery, who had been in Butte since 1906. Mrs. Lammie said “Mrs. Wong [Cue] is an excellent little woman.” Mr. Marcello also testified that Mrs. Wong Cue paid her rent to him and that she made her own living. Mrs. Gordon Schermerhorn testified that she was 45 year old in 1924 and born in England. She had been living in Butte for about ten years. Mrs. Schermerhorn and Mrs. Lammie were neighbors and good friends of Mrs. Wong Cue. All three witnesses testified that they were confident that Mrs. Wong Cue lived separately from her husband. Mrs. Wong Cue application was approved and she and her daughter and nephew left for China in September 1923. The file ends with Mrs. Cue’s departure. There is no further information in the file. It was important that she made her own money because she did not want to depend on her husband to get back into the country. Since he was under investigation, his status could endanger her ability to return to the U.S. She needed to show that she made her own money and lived away from her husband so she could prove she was a merchant. Merchants were exempt from the Exclusion Act. If she had merchant status she could get back into the U.S. no matter what he did.